For a change, here is some art that is not on the internet or in a gallery. It's on the wall in my step-uncle's playing-about-on-t'internet room. He inherited it from his step-dad, who ran a pub on the harbour front in Ramsgate, and had accepted it as payment for a bar tab. The artist, Paul Teschinsky, is thought to be a German Jew who came to Ramsgate just before the Second World War. A quick search on the google showed that his favourite subject during the First World War had been German warships and submarines. Many were of a patriotic nature, perhaps approaching propaganda; some illustrated post cards issued by the German army postal service. 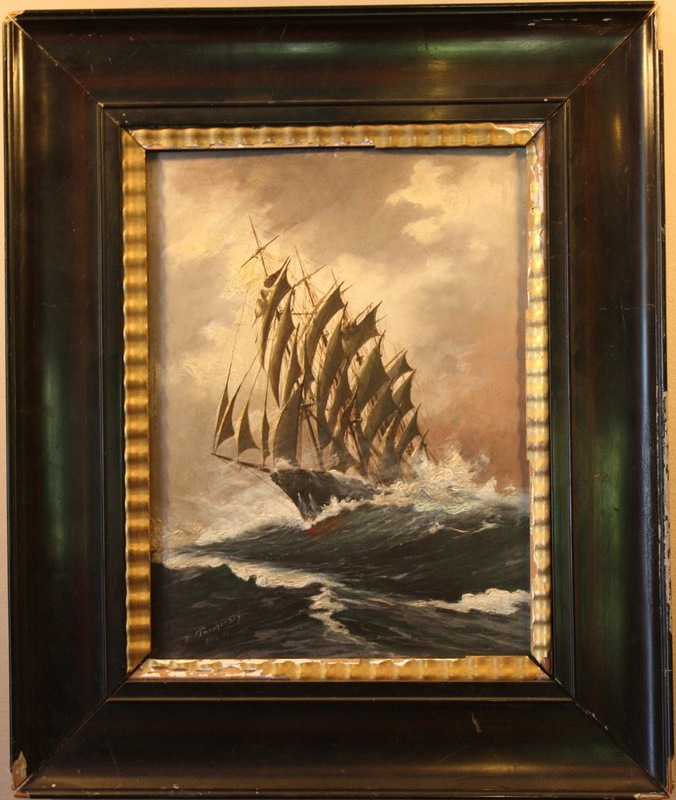 Ironically, the ever present enemy alluded to in these painting would later give him refuge from his own country: paintings were titled 'War against England stormy day in the North Sea', 'German submarines off the coast of England', and 'The turbine cruiser Dresden chasing the English steamer Mauretania'. The sailing ship that once adorned an English harbourside pub (I like to think the artist watched ships docking as he drank his beer) is alluring. Viewed one way, the ship appears menacing, emerging from the waves like a Hollywood shark; the odd angle of the masts emphasising the forward speed, and suggesting that the ship is perhaps not real. Perhaps it is a ghost ship. Viewed another way, this ship is in a perilous struggle with the waves. The water pouring off the deck is not a good sign; and the angle of the masts is due to a large heel angle or rolling motion. Perhaps the ship is experiencing dangerous parametric roll? Before this non-linear coupling between heave and roll was understood, ships did on occasion mysteriously roll over and capsize. The conditions for parametric roll are present in this painting. The bow emerging from the waves, and the stern almost engulfed, would lead to a very large oscillation in submerged volume (hence roll righting moment).